Root canal treatment (a.k.a. endodontic work) is a dental treatment performed to save the life of the tooth. During a root canal procedure, the dentist removes the nerve or dental pulp of the tooth. Often, trauma or tooth decay has damaged the nerve of the tooth. If your tooth has become badly infected or inflamed (tooth infection), you’ll probably be experiencing severe pain. There also may or may not be severe swelling that might extend the surrounding tissues. Your tooth may become sensitive to temperature changes and be tender to touch. Sometimes, the toothache may be so bad that it disturbs your sleep and may not be remedied by pain medication. Another symptom of pulp infection or inflammation is a bad smell or taste in your mouth. Occasionally, on the first visit, your dentist will remove the nerve and do nothing else – purely to eliminate pain. At other times, the dentist might start to clean the canal within the tooth root which houses the nerve and prepare it for a new material. This new material will fill the canal where the nerves were sitting previously. Your dentist will use an endodontic file, which is like a tiny bottlebrush, gently cleaning the debris away. Using x-rays, your dentist will then assess your nerves and teeth before going further. An antibacterial solution will be used to flush the roots and remove any remaining bacteria and debris. Afterwards, we will use an antibacterial dressing to dress the root. Then, a temporary filling will be placed over the top to keep infection (or reinfection) at bay. We will reopen and examine your tooth to check that no bacteria have proliferated in the area. More antibacterial solution will flush the area, then the roots will be filled with warm or cold rubber points, then bonded to the side of the canal with sealant. If we still cannot control your infection, a third or even fourth appointment may be necessary. What is considered a successful root canal treatment? A successful procedure means that you can keep your teeth and not be at the mercy of nagging infection. However, care must be taken! To make sure reinfection never recurs, you must adhere to your dentist advice and come in for regular checkups and x-rays. What is root canal (endodontic) treatment? Root canal treatment is a multifaceted treatment where the dentist removes the tooth pulp (and always the nerve) then seals it to protect against further infection and pain. No, root canal treatment is not painful as we give you adequate medication/anaesthetic to numb any pain. 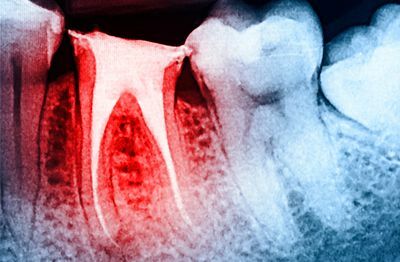 How long will it take for the pain to go away after root canal? After the procedure, you may experience some discomfort or pain. These sensations usually settle in three to five days. Your dentist will give you appropriate medication to help manage these sensations during this time. Can I eat after root canal treatment? Your mouth will feel numb after your root canal treatment, so you must wait until the numbness wears off to prevent you from biting your tongue or cheek. Avoid biting down on food with your treated tooth until your dentist has deemed it fully restored. Can I go back to work after my endodontic treatment? Yes, you can go back to work after your treatment; however, you will be numb for a good two to three hours. Occasionally, the few patients who experience strong pain or rare complications may prefer to go home and rest for the day. What is the success rate of a root canal treatment? Root canal treatment has a high success rate of 95%. However, sometimes complications can occur, such as calcified root canals or curved roots, which make successful treatment more difficult. What is the cost of a root canal treatment? As most cases differ, we cannot give an estimate over the Internet. It is best that you book in to see one of our experienced dentists to discuss your issue so they can give you an itemised quote which you can take to your health fund. Please note that in addition to your root canal treatment cost, it is likely that you will also need a crown restoration performed. Can I just take antibiotics instead of having endodontic work? Antibiotics can only reach parts of your body through your blood supply hence, there will only be temporary relief from the symptoms of tooth ache. Antibiotics are used if there are systemic problems requiring treatment. Oxford Street Dental provides Endodontic treatment (root canal therapy) to patients in the Leederville area and surrounding suburbs of West Leederville, North Perth, Wembley, Mount Hawthorn, West Perth, Northbridge, Glendalough, Jolimont, Highgate, Mount Lawley, Daglish, Osborne Park, Yokine, Menora and Joondana. Contact us today to duscuss root canal therapy at our practice, conveniently located in the heart of Leederville.